Joe Kubert (born September 18, 1926) is an American comic book artist who went on to found The Kubert School. He is best known for his work on the DC Comics characters Sgt. Rock and Hawkman. His sons, Andy Kubert and Adam Kubert, have themselves become successful comic-book artists. Kubert's other creations include the comic books Tor, Son of Sinbad, and Viking Prince, and, with writer Robin Moore, the comic strip Tales of the Green Beret. 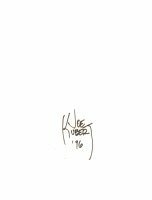 Kubert was inducted into the Harvey Awards' Jack Kirby Hall of Fame in 1997, and Will Eisner Comic Book Hall of Fame in 1998.